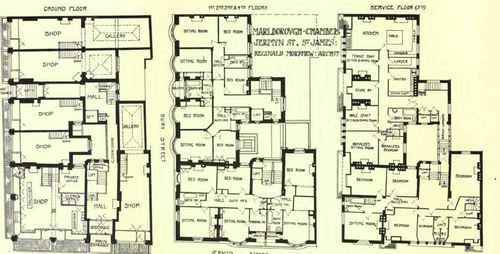 Marlborough Chambers, Jermyn Street, designed by Mr. Reginald Morphew, and illustrated in Fig. 20 and Plate II., show a somewhat similar scheme of living as adapted to English needs. The ground floor has, for the sake of the rents obtainable on this very valuable site, been devoted to lock-up shops with storerooms in their basements, some of these having large showrooms extending in the rear and top lighted, while the corner shop possesses private offices. There are two entrances, that in Jermyn Street being the principal, and leading to a large hall which contains the porter's office and passenger's lift. A corridor passes down, lighted from an area, to a second hall containing another staircase and lift which serve a different section of dwellings, while providing the emergency exit in case of fire demanded in London. This second hall can also be reached from the side entrance in Bury Street, which is intended more for the use of servants than for the inhabitants of the flats. As in the American apartmental hotel, it is intended that all the cooking shall be done in a common kitchen, and the flats served by a staff of servants kept by the management; but there is no general dining-room, and in each suite of flats there is sufficient sitting-room accommodation for the meals to be taken in privacy. These flats are not intended for family residence, but to be used as bachelor's chambers, so that most of them are provided with only one sitting-room and one bedroom, together with a bathroom, though some larger ones have additional bedrooms, so that they could be shared by two or three young men, and also a smoking-room. A great deal of trouble has been taken to make the flats comfortable. Thus in suite No. 1 there are recesses both in sitting-room and bedroom, and there is means of access from the sitting-room to an open balcony, while suite No. 2 contains a large number of cupboards. It will be noticed that the directness of planning which has been so observable in Figs. 305 and 306 is here replaced by a number of clever little devices to secure comfort in the various rooms, a great deal of use being made of bow windows and balconies. Every room is provided with its own fireplace, but the chimneys have been carefully grouped both for the sake of economy and to secure satisfactory effect in the elevation. As in the case of the American plan, it would be quite possible to rearrange the suites without any great amount of trouble by closing existing doors or opening others, but this would have to be done by actual structural alteration, not by merely locking a door which has been provided. 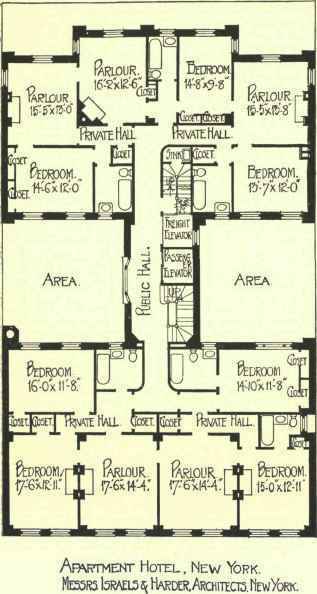 Perhaps the most interesting plan is that of the top floor, which contains the kitchen and the staff bedrooms. To these it has been found impossible to give quite sufficient accommodation, although the kitchen is certainly large; but the two staff dining-rooms for men and women servants respectively are hardly sufficient, considering how many persons would have to occupy them. The lifts have been carried right up to this floor from the bottom, and the manager has his apartments so placed as easily to control the staff, while being within access of the various residents when necessary. The Jermyn Street frontage, even on this top floor, has been reserved for a suite of flats, thus reducing the number of staff bedrooms; though one would hardly think that enough rooms had been provided to meet the requirements, and as a matter of fact it has been found necessary for many of the servants to live out, particularly the private valets of the various residents. Of late years the tendency of English flat planning has been towards the avoidance of enclosed areas, such as those shown in Figs. 17 and 19, and of the long back additions, with the long and narrow spaces between them exhibited in Fig. 16, and the substitution of plans in which the rooms all obtain their light from the main streets, while the back is given up to corridors and kitchens, as in Fig. i8a. This is not economical in frontage, but produces a more healthy building, and a more obviously cheerful one - a very great consideration in attracting tenants. Flats are essentially residences which are built to let, and not to be used for the habitation of their owners. Personal likings consequently have not to be considered, and eccentricities, and even unusual conveniences, which are permissible and often imperative in private residences, have to be avoided, and that provided which is more likely to be generally acceptable. The impression of spaciousness and luxury should be given by means of a good approach and well-lighted passages of ample width. Little conveniences, such as the provision of permanent wash-stands in the bedrooms, with hot and cold supply, are greatly appreciated, as also is cupboard room - often obtainable at a high level without encumbering the floor space; for all these things go to reduce the amount of movable furniture necessary, and enable the payment of rent to save the necessity for capital outlay, it being remembered that a migratory class is being catered for which can afford to pay in small instalments rather than in bulk.